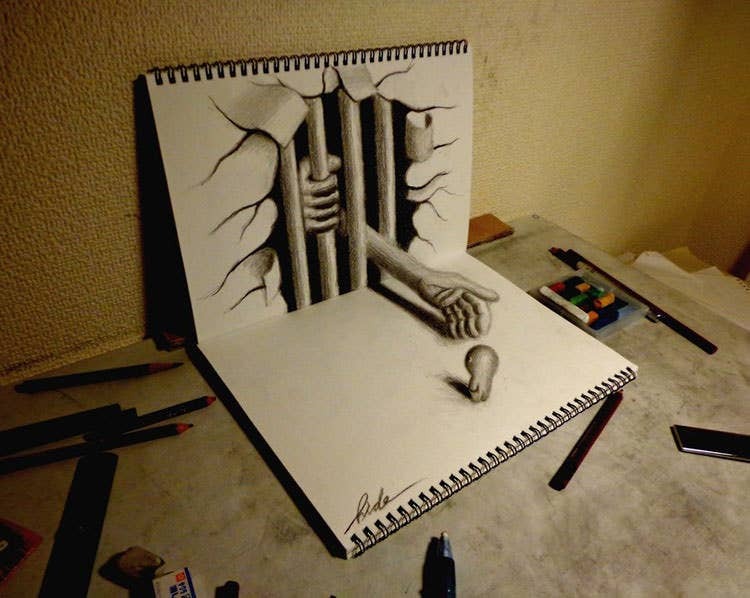 Creating illusions is what draws many graphic designers to art, and one of the chief elements of the acquired skill-set of a graphic designer is the ability to make 3D sketches. 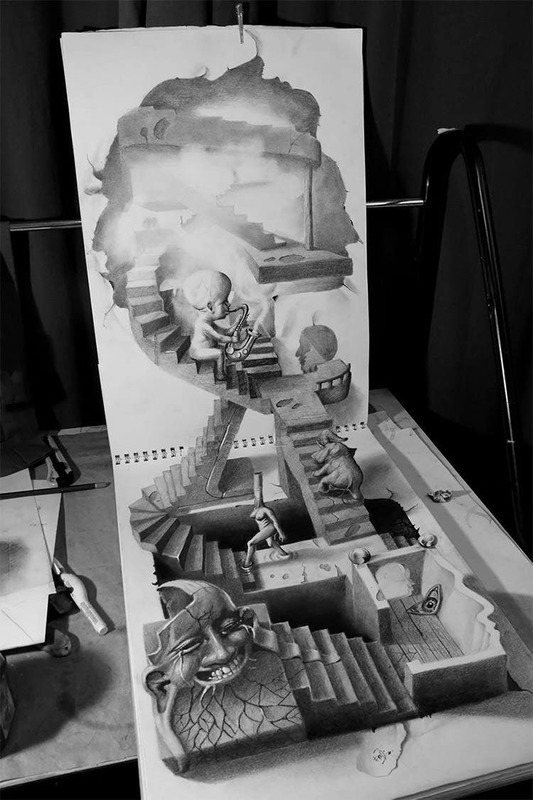 3D pencil drawings rely on an understanding of perspective to convey their illusions. 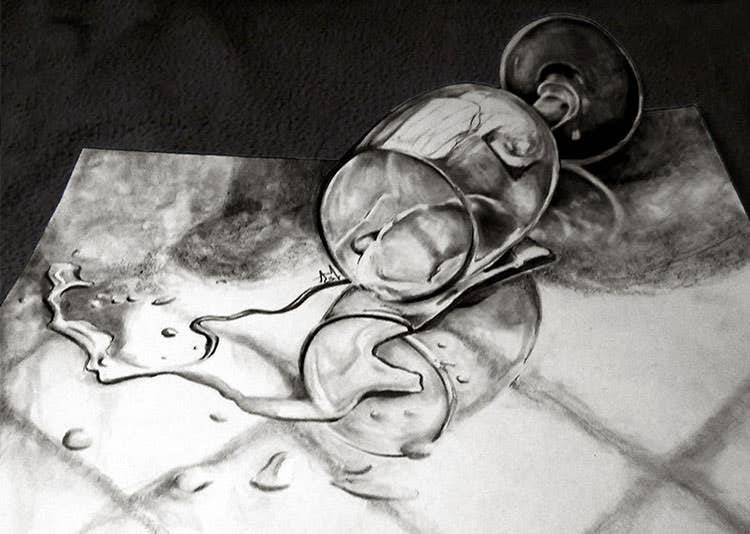 Aspects of sketching such as highlights, shadows and mid-tones form the basis of 3D pencil drawings. The highlight must be used on the part of the subject directly facing the light while the shadow needs to be used on the part that faces away from it. Mid-tones need to be used on that part of the subject which neither faces the light nor is in complete shadow. Working with basic shapes like 3D spheres, cubes, cylinders is a good way to begin shaping your best 3D pencil drawings. This is a simple template which has a 3D pencil sketch of a fantasy world landscape. 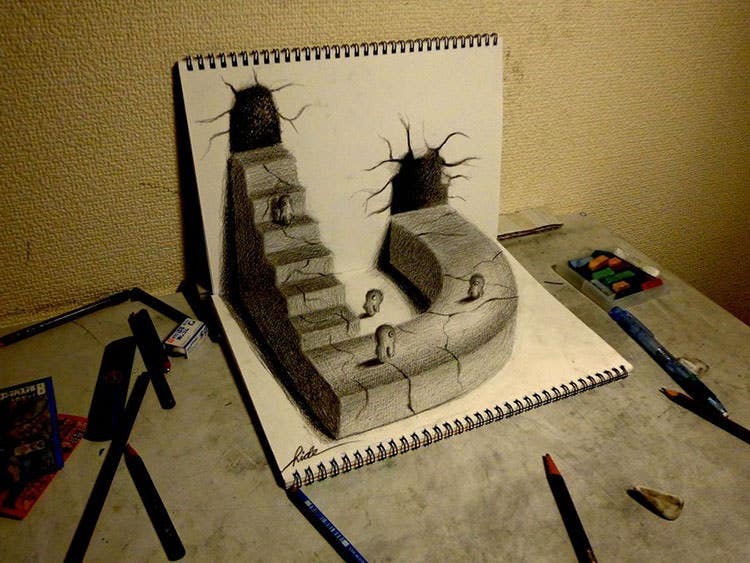 The characters, doors and stairs are neatly sketched with the right shades to give a realistic appearance. Download this world drawn template to create comics or fantasy games. Use this template to get a simple 3D sketch which portrays a realistic natural landscape. The high resolution artwork is drawn on ordinary notebook paper and can be used to design natural landscape sketches of a different perspective and color tone. 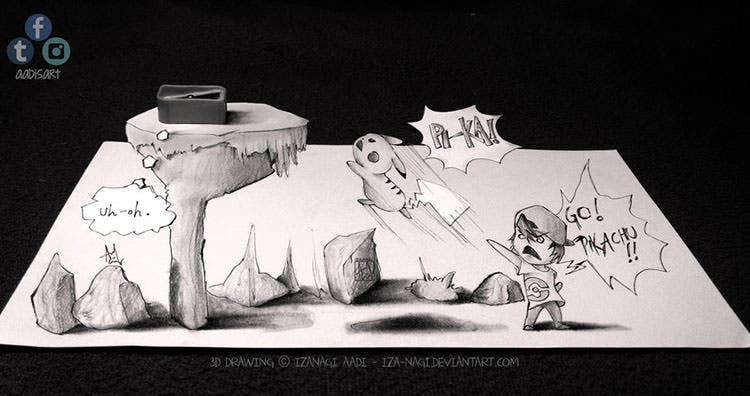 Use this template to get full access to a huge collection of 3D pencil drawings on paper. The highly realistic images can provide you a very good looking artwork. 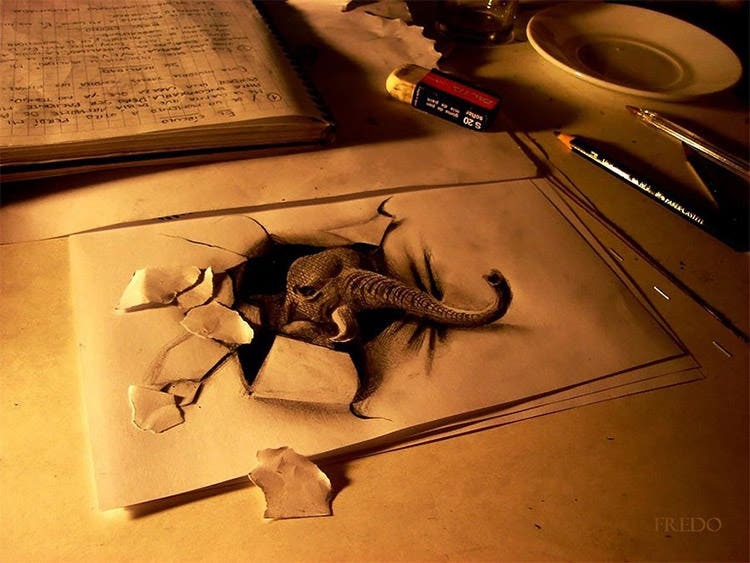 It can inspire many young artists to start drawing 3D pencil sketches. 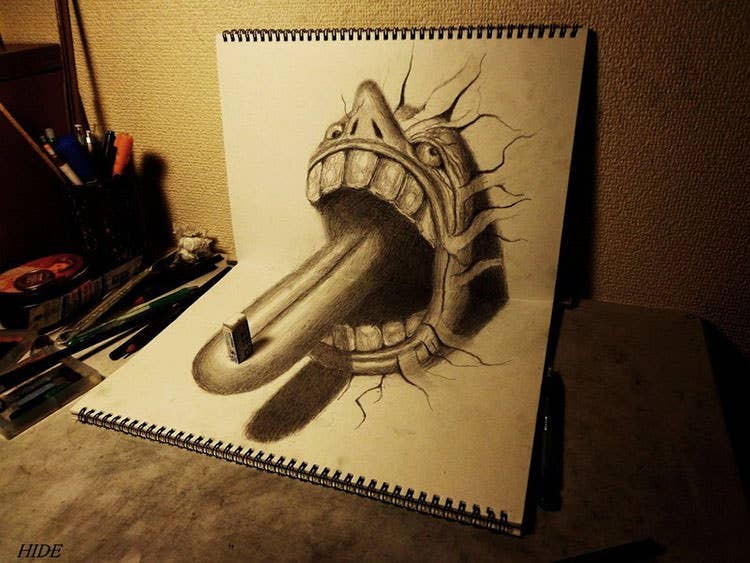 This template contains a 3D sketch of a monster who sticks out a tongue to consume food. 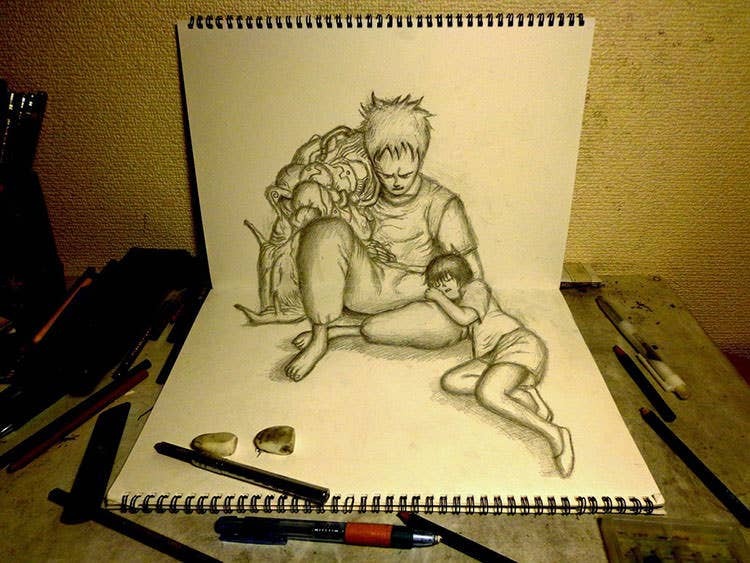 The realistic nature of this pencil sketch makes it a wonderful addition for all artists and designers. The sketch can be downloaded as an art print, canvas or photo. Add 3D fantasy characters to your design or artwork using this handy template. 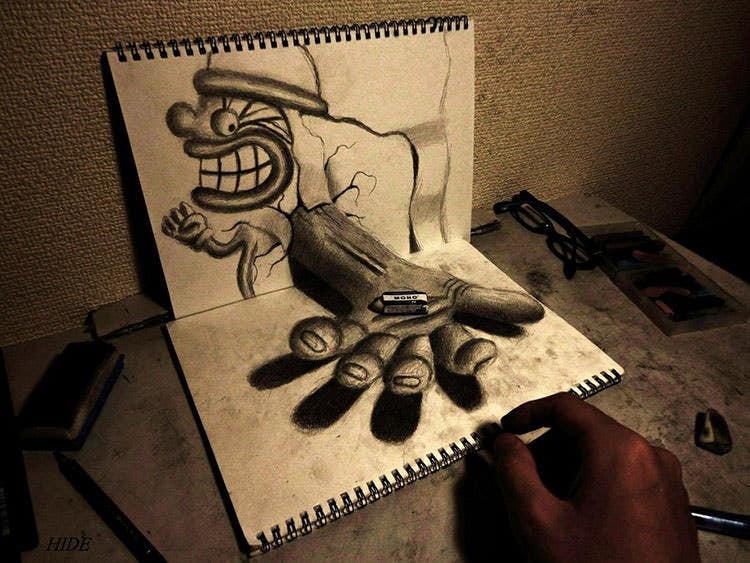 The 3D sketch is crafted to perfection and it appears as if the character has life. Refer links and videos to draw similar 3D sketches or download them for your reference. Use this template to give your design a neat sketch which portrays a hand, beckoning to evil from inside the prison. A very realistic image can be applied to your design and you can also download this high resolution picture. 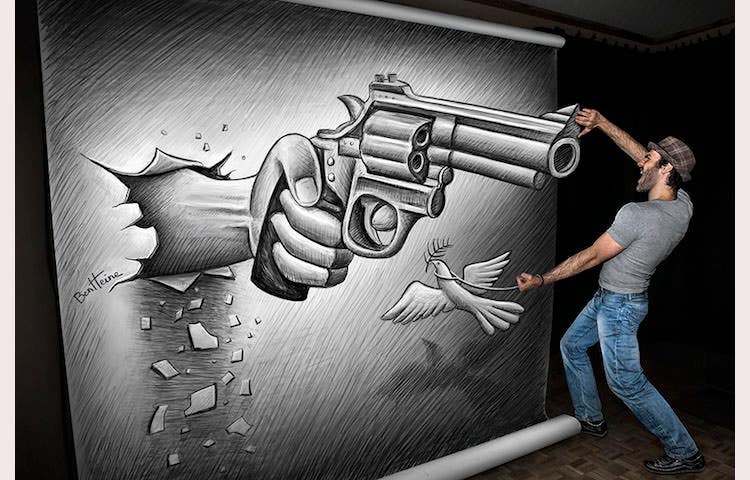 This template comes with a neat 3D pencil illustration which is drawn using light and shadow techniques to give a realistic look. 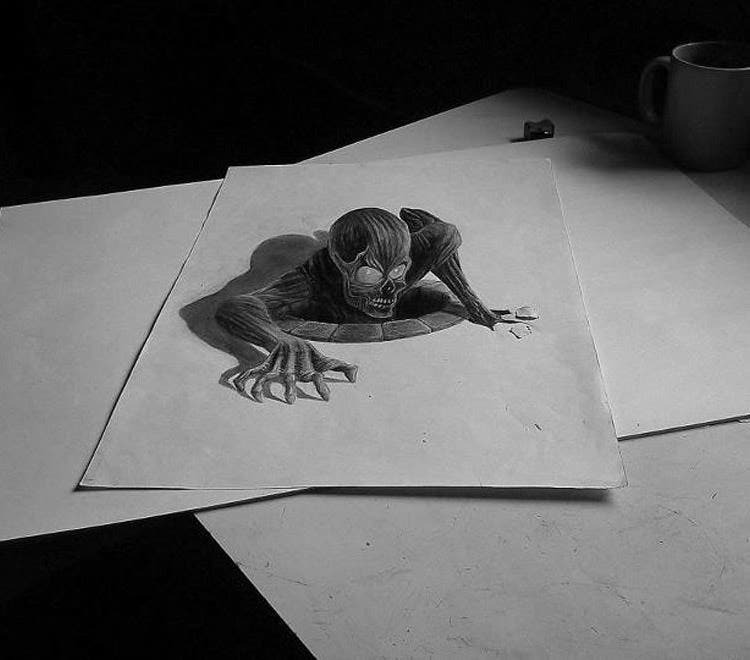 Refer 3D pencil drawings by Alessandro Diddi to learn more techniques and explore other neat sketches drawn by the artist. This template contains a cool artwork of Killua, a cartoon character. 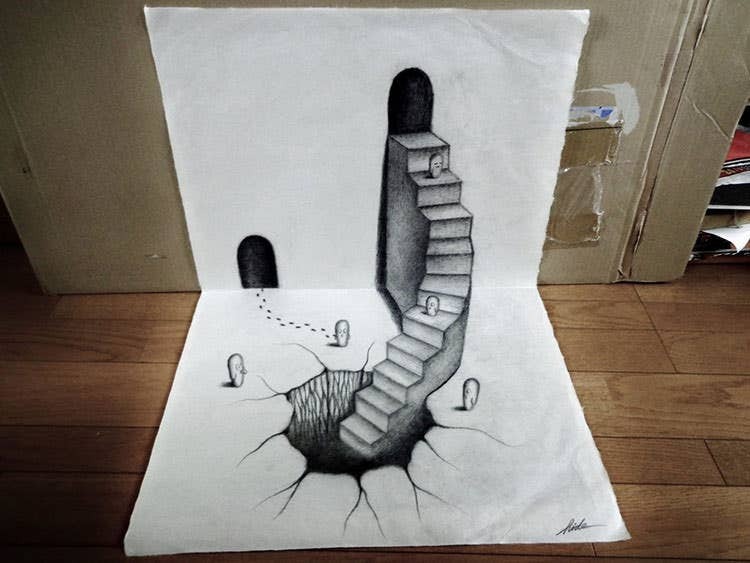 The 3D sketch is done using a variety of pencils and charcoal sticks. 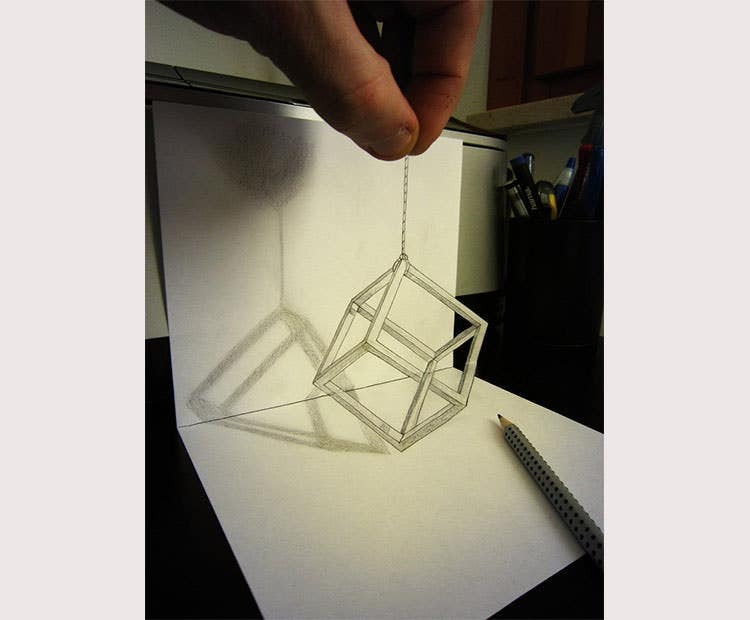 For tutorials and ideas, search the topic ‘How to draw 3D pencil drawings step by step pdf’. 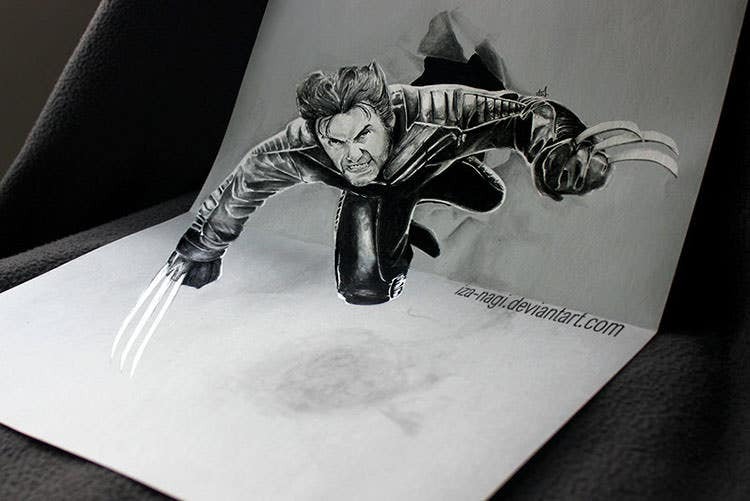 An amazing 3D pencil sketch of the popular character ‘Wolverine’ from the X-Men series can be seen in this template. The dark shades and fine details add great value to the picture and so it can be used to create exquisite artworks. 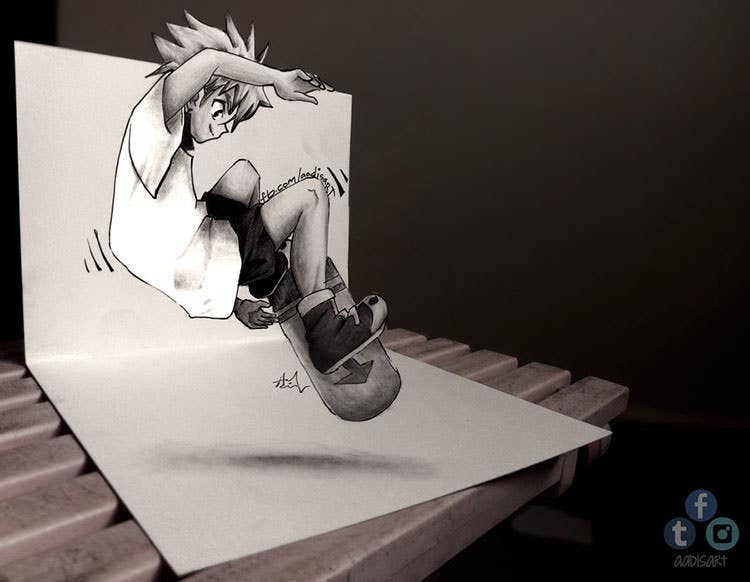 This template contains a 3D sketch which is drawn on ordinary A3 paper. 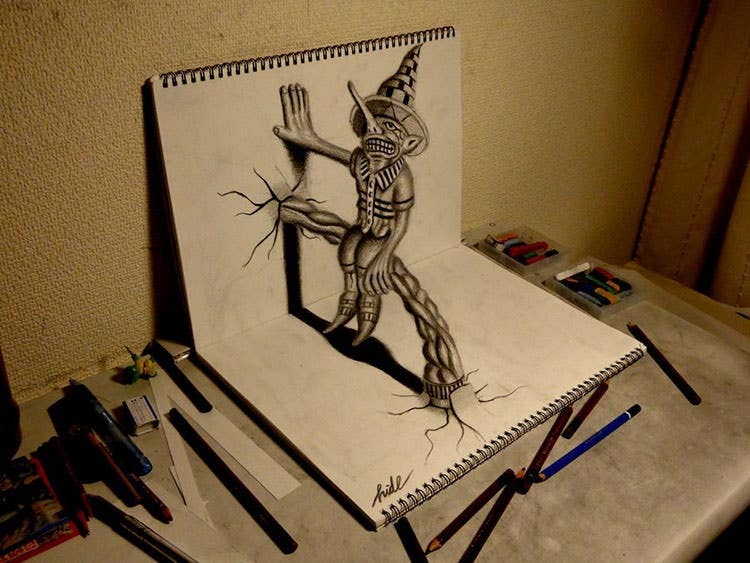 When looked from a certain angle, it appears as a 3D image. 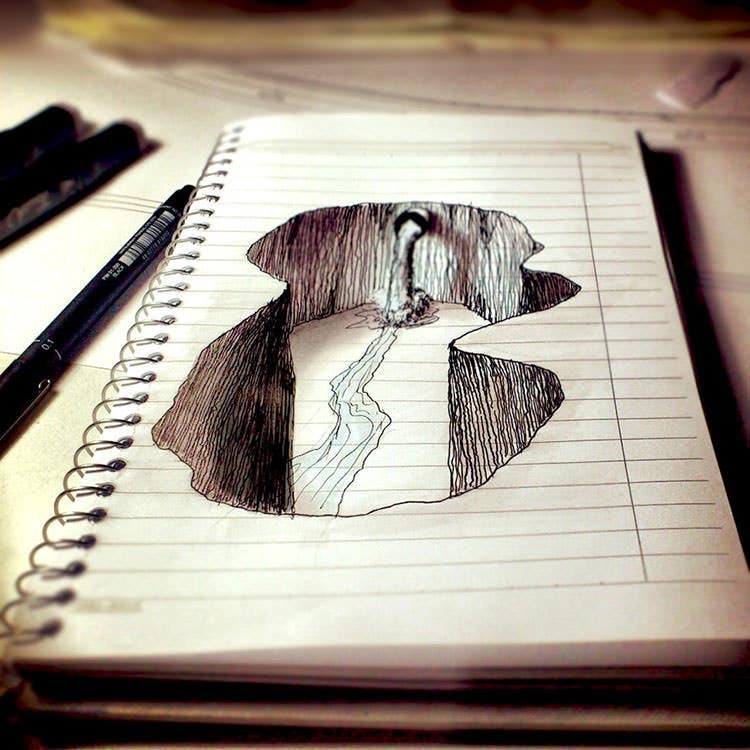 3D pencil drawings videos can help you develop your 3D drawing skills for making top-quality artworks or designs. 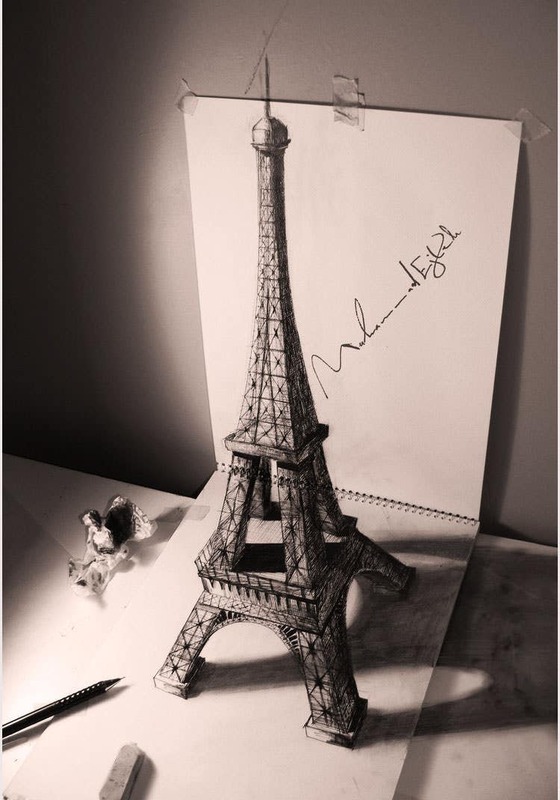 This template has a fantastic 3D artwork of the Eiffel Tower in Paris, France. The high level details on the picture create a strong impact on your designs. 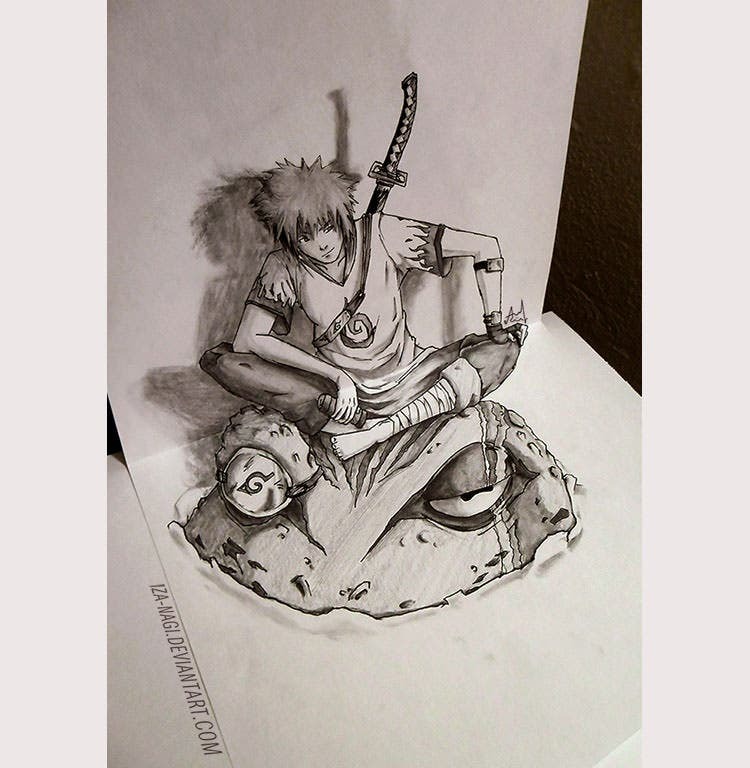 3D pencil drawings tutorial can help you make great artworks like this one. 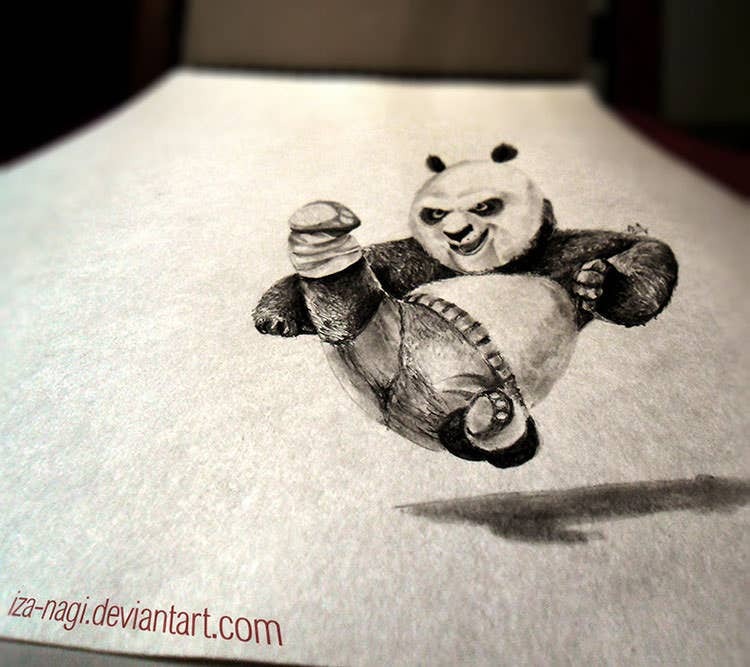 A 3D picture of Po from the animated movie ‘Kung Fu Panda’, this template is a great addition for your artwork and can give a cool appearance. 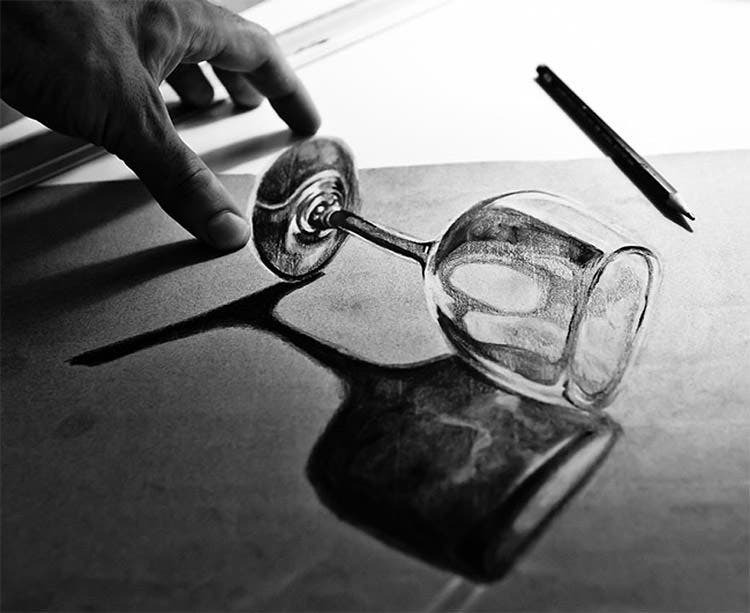 Check out 3D pencil drawings by Ramon Bruin to get more ideas on drawing 3D images. Add awesome special effects to your design with the help of this dealings template which comes in high resolution format. Option for printing and downloading the file is available and you can get the file in various forms such as canvas, art print and photo. This template provides a spooky environment to your design. 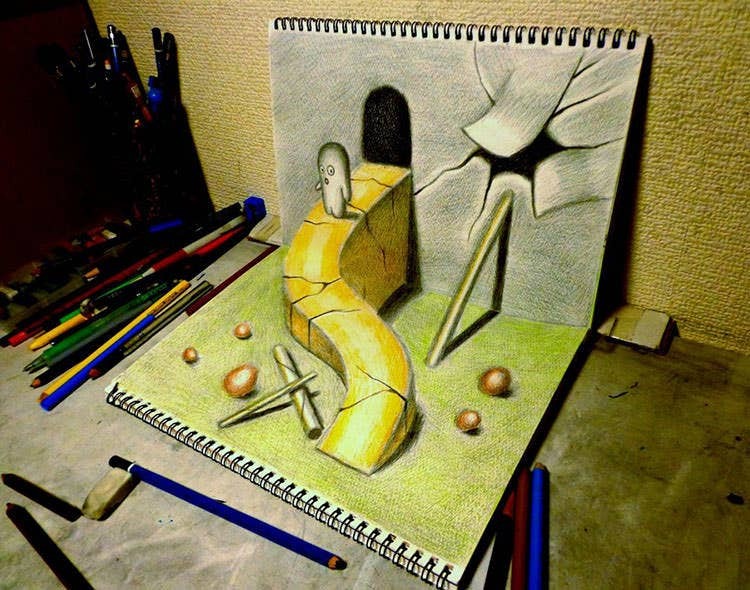 The 3D picture of a deserted land is beautifully portrayed with many colourful objects, landscapes and neat detailing. A dark background is used to display the room from which the ghost has come out. On the basic templates, creating complex figures becomes easy. 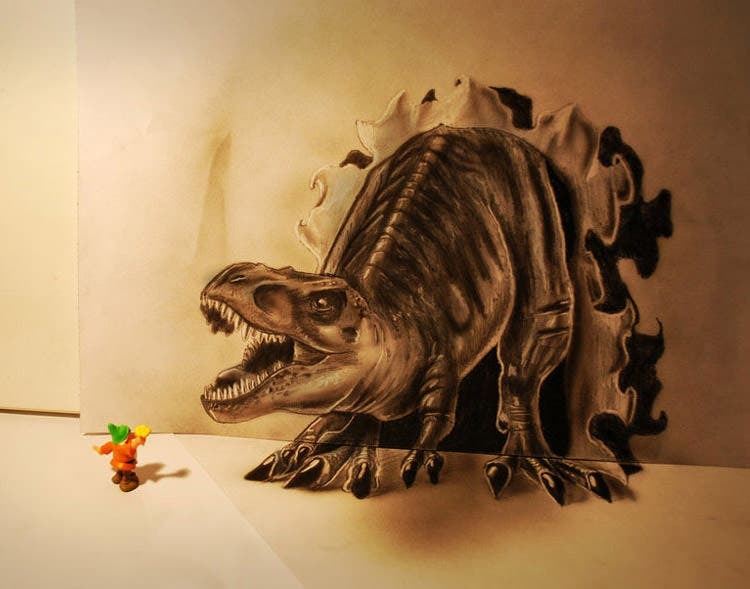 The most commonly used themes for 3D pencil drawings include cartoon figures, architectural structures and animals. 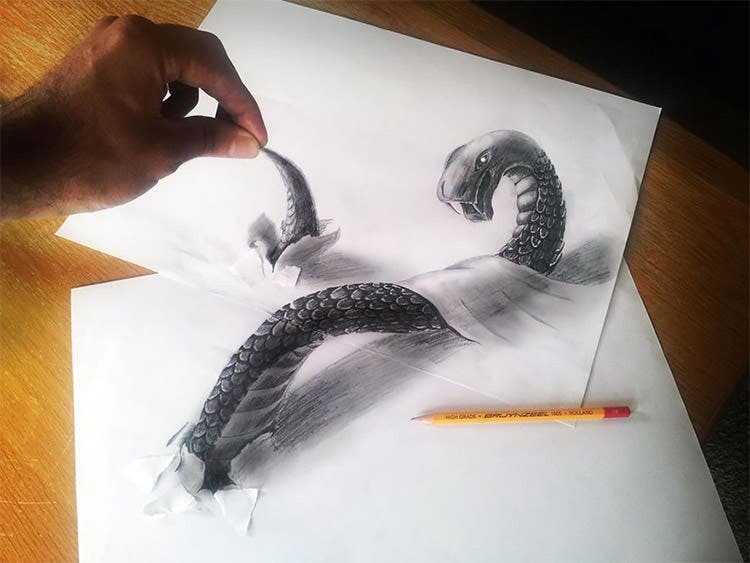 Serpents render themselves very well to premium 3D pencil drawings and the Ouroboros-themed serpent is often used by designers to create scenes. You can also see Animal Stencil Templates. Interweaving different figures in a complex pencil drawing is a good way to create a lasting impression on the mind of the viewers. 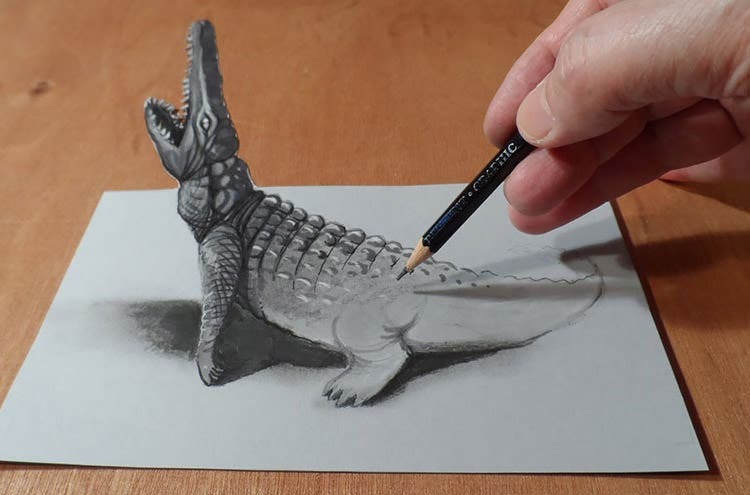 Although black and white is the commonest template for 3D pencil drawings, colours are also sometimes used, especially for special contrasts. Using Photoshop, and other online graphic tools, is a good way to enhance your hand-made or computer generated pencil designs, which become more beautiful and realistic. 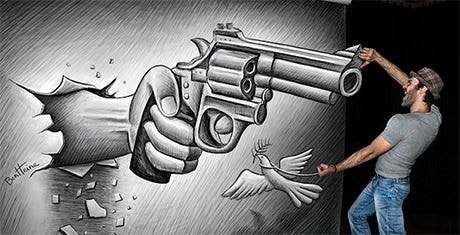 You may also see Pencil Drawing Pictures. 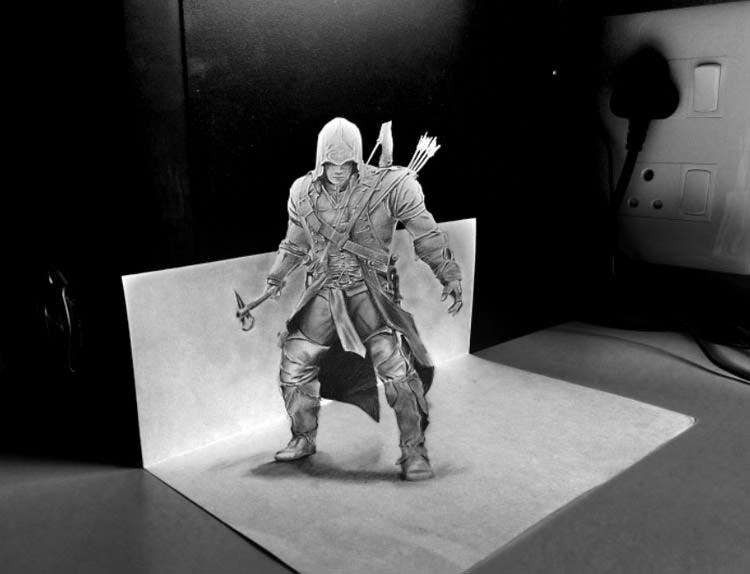 3D pencil sketches can improve the quality of your graphic designs, artworks and take it to the next level. 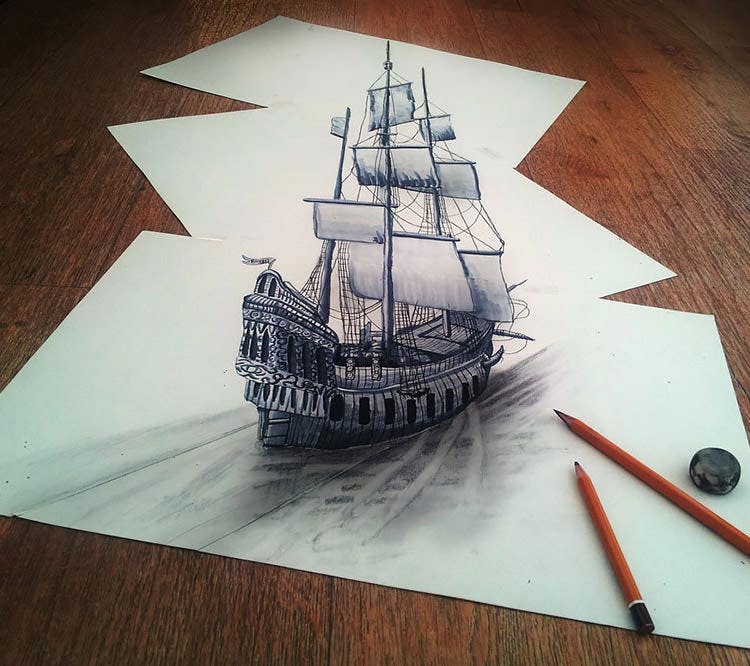 These design templates containing 3D pencil drawings can help you create realistic images and landscapes. Add high quality designs to your gallery using these spectacular design templates containing 3D pencil sketches. If you have any DMCA issues on this post, please contact us!